The full scope and achievement of Knausgaard's monumental work is evident in this final installment of his My Struggle series. Grappling directly with the consequences of Knausgaard's transgressive blurring of public and private Book Six is a troubling and engrossing look into the mind of one of the most exciting artists of our time. Knausgaard includes a long essay on Hitler and Mein Kampf, particularly relevant (if not prescient) in our current global climate of ascending dictatorships. Karl Ove Knausgaard was born in Norway in 1968. His debut novel Out of the World won the Norwegian Critics Prize in 2004 and his A Time for Everything was a finalist for the Nordic Council Prize. 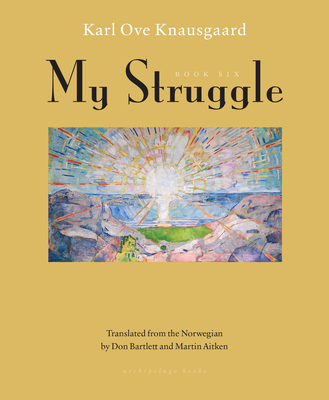 My Struggle is a New York Times Best Seller and has been translated into more than twenty languages. Knausgaard writes regularly for the New York Times Magazine. In 2010, he co-founded the independent publishing house Pelikanen, based in Stavanger. About the translators: Don Bartlett has translated novels by many Danish and Norwegian authors, among them Jo Nesbø, Roy Jacobsen, Lars Saabye Christensen, and Per Petterson. He lives with his family in Norfolk, England. Martin Aitken is the acclaimed translator of numerous novels from Danish and Norwegian, including works by Karl Ove Knausgaard, Peter Høeg, Jussi Adler-Olsen, and Pia Juul, and his translations of short stories and poetry have appeared in many literary journals and magazines. In 2012 he was awarded the American-Scandinavian Foundation's Nadia Christensen Translation Prize.